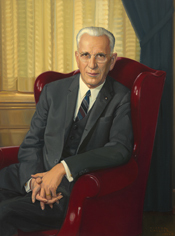 McCORMACK, John William, a Representative from Massachusetts; born in Boston, Suffolk County, Mass., December 21, 1891; attended the public schools; studied law in a private law office; was admitted to the bar in 1913 and began practice in Boston, Mass. ; member of the State constitutional convention in 1917 and 1918; during the First World War served in the United States Army in 1917 and 1918; served in the State house of representatives, 1920-1922; member of the State senate, 1923-1926, serving as Democratic floor leader in 1925 and 1926; delegate to all Democratic State conventions since 1920; delegate to the Democratic National Conventions in 1932, 1940, 1944, and 1948; elected as a Democrat to the Seventieth Congress to fill the vacancy caused by the death of James A. Gallivan and on the same day was elected to the Seventy-first Congress; reelected to the Seventy-second and to the nineteen succeeding Congresses and served from November 6, 1928, to January 3, 1971; chairman, Select Committee on Astronautics and Space Exploration (Eighty-fifth Congress); majority leader (Seventy-sixth through Seventy-ninth, Eighty-first, Eighty-second and Eighty-fourth through Eighty-seventh Congresses), minority whip (Eightieth and Eighty-third Congresses), Speaker of the House of Representatives (Eighty-seventh through Ninety-first Congresses); was not a candidate for renomination in 1970 to the Ninety-second Congress; resided in Boston, Mass., until his death in Dedham, Mass., November 22, 1980; interment in Saint Joseph Cemetery, West Roxbury, Mass. Papers: 1936-1971. 66 feet. Correspondence, congressional files, personal papers, publicity, photographs, memorabilia, and tape recordings. Unpublished finding aid in repository. Oral History: 55 pages. Interview conducted by Lyndon B. Johnson Library. Oral History: September 23, 1968. 55 pages. Description in library. Papers: December 20, 1963; January 23, 1968. 2 letters. Finding aid in repository. Papers: 20 letters (1962-1970) in the Frank Leslie Chelf papers, 1897-1971. ca. 8 cubic feet. Finding aid in repository. Gordon, Lester I. "John McCormack and the Roosevelt Era." Ph.D. diss., Boston University, 1976. Nelson, Garrison. "Irish Identity Politics: The Reinvention of Speaker John W. McCormack of Boston." New England Journal of Public Policy 15 (Fall/Winter 1999/2000): 7-34. ___. John William McCormack: A Political Biography. New York: Bloomsbury, 2017.